Our screens big and small might seem saturated today with bodies we call – at best – “economic refugees” seeking what we refer to as the “freedom” of a new life. Statistics fill the headlines and even the so-called “stories” themselves, clamoring the burden of the unwelcome arrivals. Feature films and documentaries alike propose to tell us about the toll they take on the host countries along the Mediterranean’s northern rim, who in fact are pushing their immigration borders further out to sea yearly as the waves swell with boats and those washed over due to natural and human catastrophes. It almost looks like another cliché by now to ask to get to know the people behind the numbers. What do they do and why would they leave? What do they know of what lies ahead? “By Africans about Africans” – would such films suffice? Hardly, since much of the world forgets that such a place is a continent, a vast one, made up of separate countries, political histories, neocolonial regimes, tribal legacies, languages, and religions, not to mention natural resources, eco-systems, and ways of managing them or not. Perhaps “point of view” gets us somewhere, character point of view, even within regions with overlapping cultures, wars, and troubles. On one night at UCLA’s Film and Television Archive at the special series, “In Transit: Refugees on Film” (running April 7-May 5) we get lucky and find the chance to see works by two filmmakers from the same homeland, born into families in the same locale with the same occupation, even if generations apart. 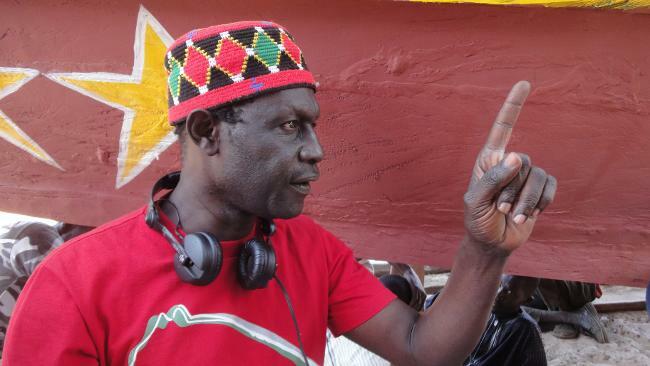 One is Moussa Touré, whose film, La Pirogue premiered at the 2012 Cannes Festival in the segment Un Certain Regard and then at 80 festivals around the world. The other is Ousmane Sembene, long ago deemed the Father of African Cinema, whose first feature, Black Girl (La noire de…) made film history by bringing a new purpose and language of cinema to Senegal and the world. Both were the sons of fishermen, and if Touré tells of such men fleeing illicitly across the sea today, along with one brave woman who is a stowaway on their boat, Sembene himself was once a stowaway. Perhaps one of the more surprising truths both films reveal is that so-called “Western” eyes see differently, look differently, especially at the movies. A clear example hits us right away in La Pirogue by Touré. Its opening scene is eye-catching for what would, in conventional viewing habits, be construed as exotica: a festival of drums, dancing, and especially wrestling between two half-naked he-men bedecked in headbands, armbands, and necklaces of shells and talismans. Smoke and chants fill the air as men come to place their bets, though the dousing of the fighters in the hot sun appears to be ceremonial. Other onlookers appear in T-shirts and baseball caps slugging down popular beverages while on cell phones. Just as the evolving situation is hardly about plot, the narrative veers away from building a psychological identification with Baye Laye and his wife, Kine (Diodio Ndiaye) from whom he must depart, through dialogue and action. Instead it frames them in a scene of intimacy borrowing the gestural language of dance as they wordlessly feel each other’s faces, as if to trace the lines and etch them in memory, before Baye Laye ritualistically pours water marking the ground and then drops an egg upon taking his leave. Time plays differently on the screens of West African cinema, characteristically a social cinema rather than one of individuals. So when the camera lingers on the faces, diverse in color, features, form, and expression, we see each in relation to all the others. 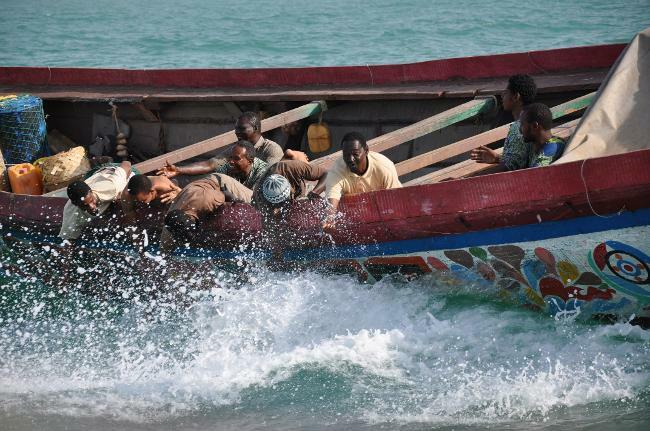 While one of La Pirogue’s passengers might aspire to a career in soccer and the other to a future as a musician, one might be missing a leg and another missing a husband and child, each is also a part of a group and relates to the others as such. Baye Laye’s brother Abou (Malaminé Dramé) might look like a lazy slacker fixated on his iPhone, but when the passengers need fish to eat, he sees it as his role to provide it, and when only music might calm them, he becomes their Orpheus. The rambunctious, devil-may-care Lansana (Laïty Fall), who has planned the trip and recruited its members, may mock their captain but takes care to protect his interests for future operations, whereas the marabout Samba (Balla Diarra) brings spiritual wisdom and comfort for his tribesmen as he seeks harmony among them. 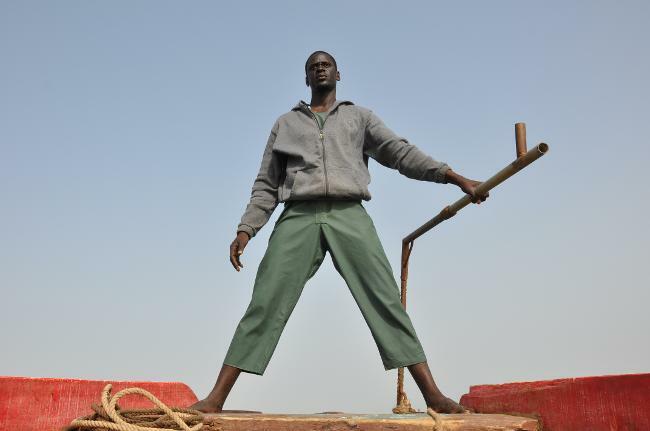 Baye Laye himself stands anxiously but stoically at the helm like the mythic masthead of a tall sailing vessel as he manually guides the rudder, steering this over-sized dinghy with thirty lives in his hands. Western eyes see a motley crowd of desperate hopefuls, some who have never before seen the sea and are traumatized at the first swell. 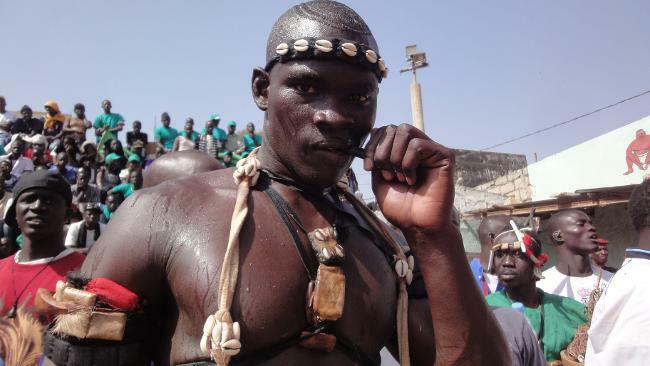 But Touré’s home audience may recognize any of twelve ethnicities, all who live peacefully together in Senegal: the Toucouleurs, for example, who hold to their religious beliefs, the Wolofs who are relatively individualistic, and the Fulas who follow their tribal chief as a collective. 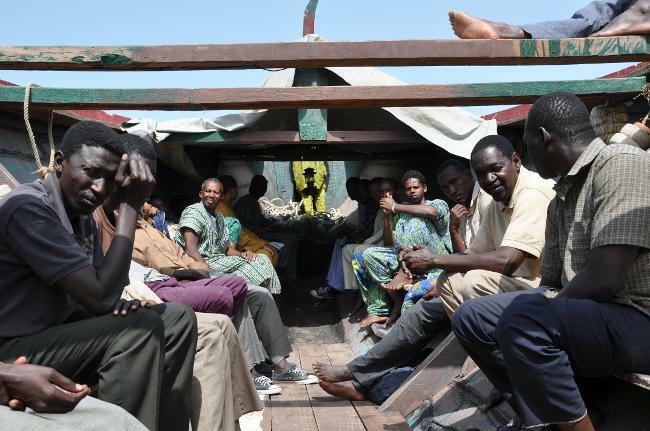 As such, together they endure the boat that becomes more claustrophobic and suffocating as time goes on, with temperatures easily 95 degrees Fahrenheit on the deck and 110 down inside. That’s when things go well, before storms both natural and moral bear down on the passengers who come to feel like captives in a perilous prison. On one hand, the boat begins to drift, a metaphor for a country going adrift when its horizon becomes unclear. In Senegal, half the population today is under twenty. With immense disparities in the distribution of wealth and government corruption that derails opportunity, it is said that at least one in every family takes off on a boat to Europe looking for work. So on the other hand, that risk becomes a noble endeavor. To French President Sarkozy’s hypocritical postcolonial utterance, “the tragedy of Africa is that the African man has not sufficiently gone down in history,” one of Goor Fitt’s passengers, gripped with fear, says, “I am an African man who has decided to go down in history.” The film was made in 2012. 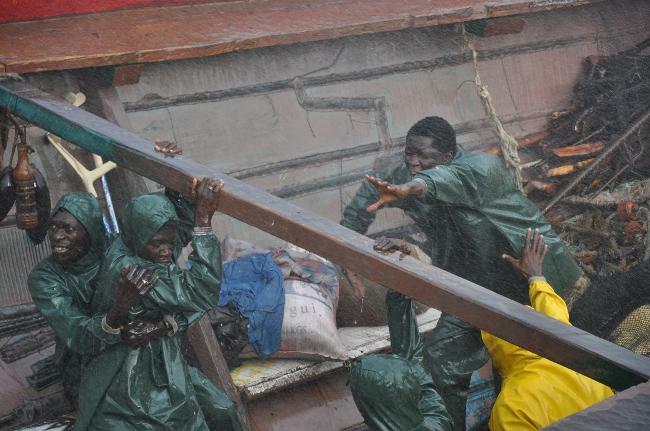 Between 2003 and 2011, thousands of pirogues departed from Senegal for Europe. Touré has sought to show the story of a mythical time that the youths of today can pass down like griots to their progeny as they recall those who braved the sea to build new lives abroad. Director: Moussa Touré; Producers: Éric Névé, Oumar Sy, Adrien Maigne; Screenplay: Éric Névé, David Bouchet from an original story by Abasse Ndione; Cinematographer: Thomas Letellier; Editor: Josie Miljevic; Sound: Martin Boissau, Agnès Ravez, Antoine Baudouin, Thierry Delor; Music: Prince Ibrahima Ndour; Costumes: Fatou Cisse; Make-Up: Anna Senghor, Aida Senghor. Main Cast: Souleymane Seye Ndiaye, Laïty Fall, Malaminé Dramé, Balla Diarra, Salif Diallo. Color, 87 min. In French and Wolof with English subtitles.